David Cameron has proved the doubters in his own party and beyond wrong by winning a majority of his own at the 2015 general election. When he was elected Conservative leader in 2005, he was seen as the party's answer to Tony Blair, a young, modern leader, who would shake off the party's "nasty" image and turn it back into the election winning machine that had dominated much of 20th century British politics. But despite big advances at the 2010 election, he was forced to form a coalition with the Liberal Democrats, handing ammunition to those on the right of the party who hated his brand of "Liberal Conservatism" and yearned for a more traditional Tory programme. Mr Cameron's presentational skills were never in doubt. His easy charm and ability to appear "prime ministerial" at news conferences and summits helped ensure his personal poll ratings remained well ahead of the Conservative Party's ratings. But critics complained that it was difficult to pin down what he actually believed in. His laid-back, almost patrician style - and tendency to surround himself with advisers from similar backgrounds - led to accusations that he was too remote from the concerns of his party's rank-and-file, some of whom drifted off to the UK Independence Party, with its traditional right-wing messages on Europe and immigration. Those critics have been silenced - for now. Mr Cameron is one of the longest serving Conservative leaders in history. Only Stanley Baldwin, Lady Thatcher and Sir Winston Churchill remained longer in the top job in the modern era. And although he has shifted his political position on to more traditional Conservative ground, ditching much of the utopian talk of creating a Big Society in favour of a focus on low taxation and sound financial management, observers have noted how little being in office has changed Mr Cameron personally. The one fact everyone knows about him is that he comes from a privileged background. He has never made a secret of it. Not only was he the first former pupil of Eton to hold office since the early 1960s, he can also trace his ancestry back to William IV, making him a distant relative of the Queen. "I'm a practical person, and pragmatic. I know where I want to get to, but I am not ideologically attached to one particular method," December 2005. "I'm going to be as radical a social reformer as Mrs Thatcher was an economic reformer," August 2008. "I don't support gay marriage in spite of being a Conservative. I support gay marriage because I am a Conservative," July 2013. "I hope they'd say I'm optimistic, I enjoy life and that I'm fun. But also that I'm quite driven in doing what I believe in," on what his friends would say about him," February 2015. "We will govern as a party of one nation, one United Kingdom. That means ensuring this recovery reaches all parts of our country, from north to south, to east to west," May 2015. At 43, he was the youngest prime minister since Robert Banks Jenkinson, the 2nd Earl of Liverpool in 1812. He was six months younger than Tony Blair when he entered Downing Street in 1997. The third of four children, David William Donald Cameron, was born on 9 October 1966 in London. 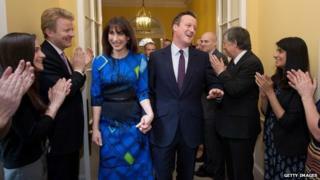 Mr Cameron has said he had a happy childhood, but one where "whingeing was not on the menu". His stockbroker father Ian, who died in 2010, was born with severely deformed legs, which he eventually had to have amputated. He also lost the sight in one eye, but David's father said he never considered himself "disabled" and rarely complained about anything. At the age of seven, the young Cameron was packed off to Heatherdown, an exclusive preparatory school, which counted Princes Edward and Andrew among its pupils. Then, following in the family tradition, came Eton. "In good times and in bad, he's just the kind of partner that you want at your side. I trust him. He says what he does, and he does what he says," US President Barack Obama. "If there was an Olympic gold medal for chillaxing he would win it," Cameron ally quoted in Francis Elliott and James Hanning biography. "Though possessed of a first-class mind, Cameron is not a reflective politician. He rarely agonises over a problem, preferring to resolve dilemmas as quickly and pragmatically as he can, generally with a group of close allies," political journalist Matthew D'Ancona. He was captain of Brasenose College's tennis team and a member of the Bullingdon dining club, famed for its hard drinking and bad behaviour, a period Mr Cameron has always refused to talk about. His tutor at Oxford, Prof Vernon Bogdanor, describes him as "one of the ablest" students he has taught, whose political views were "moderate and sensible Conservative". After gaining a first-class degree, he briefly considered a career in journalism or banking, before answering an advertisement for a job in the Conservative Research Department. Drink: Red wine, real ale. Luxury item on Desert Island Discs was "a case of malt whisky from Jura"
As a researcher, Mr Cameron was seen as hard-working and bright. He worked with future shadow home secretary David Davis on the team briefing John Major for Prime Minister's Questions, and also hooked up with George Osborne, who would go on to be his chancellor and closest political ally. Other colleagues, in what became known as the "brat pack" were Steve Hilton, who was one of Mr Cameron's closest strategy advisers during his early days in Downing Street, and future Health Secretary Andrew Lansley. Image caption Mr Cameron spoke about mending Britain's "broken society"
These young researchers were credited with devising the attack on Labour's tax plans that unexpectedly swung the 1992 general election for John Major. Mr Cameron went part-time from his job at Carlton in 1997 to unsuccessfully contest Stafford at that year's general election. Four years later, in 2001, he won the safe Conservative seat of Witney, in Oxfordshire, recently vacated by Shaun Woodward, who had defected to Labour. Samantha Cameron, who works as the creative director of upmarket stationery firm Smythson of Bond Street, which counts Stella McCartney, Kate Moss and Naomi Campbell among its clients, has been credited with transforming her husband's "Tory boy" image. They have three young children, Nancy, Arthur, and Florence, who was born shortly after the family moved into Downing Street. Their first child, Ivan, who was born profoundly disabled and needed round-the-clock care, died in February 2009. He was taken under the wing of Michael Howard, who put him in charge of policy co-ordination and then made him shadow education secretary. He also had the key role of drafting the 2005 Conservative election manifesto. But during the course of the 2010 general election campaign, he watched much of his poll lead evaporate, with the rise of Lib Dem leader Nick Clegg, a man with a similar background and smooth, telegenic manner. What's more, his big idea, the Big Society, the fruit of detailed policy work stretching back to the early days of his leadership, which envisaged parents setting up their own schools and groups of public sector workers forming co-operatives, failed to capture voters' imagination in the way he had hoped. Mr Clegg was the surprise victor in the first televised prime ministerial debate ever held in Britain - an innovation Mr Cameron had pushed hard for - and although the Lib Dem leader's advantage had largely evaporated by polling day, the election ended without a clear winner. Despite gaining 97 seats, the Conservatives' biggest increase in decades, Mr Cameron fell just short of the majority he needed to form a government and was forced into coalition talks with Mr Clegg's Liberal Democrats. The coalition he formed with Mr Clegg functioned better than anyone expected, managing to complete a full five-year term and introduce sweeping changes to the education system, the NHS, the benefits system, pensions and much else besides. Mr Clegg took a big hit in the opinion polls over unpopular coalition policies such as the massive cuts to public spending aimed at paying off the deficit, while Mr Cameron earned praise for his statesmanlike handling of set-piece events, such as his Commons statement on the Bloody Sunday inquiry. To the surprise of many, possibly including himself, the greatest difficulties he encountered were not in managing the coalition with the Lib Dems but with keeping control of the increasingly vocal and rebellious right-wing of his own party. His decision to promise a referendum on Britain's membership was seen as an attempt to placate right-wingers and stem the rise of UKIP. But there was still a sizeable minority on the Tory backbenches who did not trust Mr Cameron and hated their party's alliance with the Lib Dems. In August 2013, he suffered a major blow to his authority when he became the first prime minister in more than 100 years to lose a foreign policy vote, after dozens of Conservative MPs joined forces with Labour to block his plans for military intervention in Syria. But perhaps the biggest crisis of his premiership came in the run-up to the Scottish independence referendum in September 2014, when he cancelled Prime Minister's Questions to rush north of the border in an effort to save the Union, after a poll suggested the Yes campaign would win. He was later forced to issue an apology to the Queen, after he was overheard telling New York mayor Michael Bloomberg Her Majesty had "purred down the line" when he informed her that Scotland had rejected independence. For some, his handling of the referendum issue, by offering last-minute concessions to the nationalists, added to the idea of Mr Cameron as an "essay crisis" prime minister, who only gets fully engaged with an issue when all seems lost. It was a criticism that came back to haunt him during the 2015 election campaign, which began with him musing about his desire not to serve a third term. Only when the polls refused to budge, said the critics, did he roll up his sleeves and begin to display the passion some said had been lacking from his early performances. But the late swing to the Conservatives that confounded the opinion pollsters and allowed him to form the first Tory government since John Major's in 1992 will be seen as a vindication of his risk-averse campaign strategy - his refusal to debate Labour leader Ed Miliband head-to-head and relentless focus on a handful of simple messages, in particular his "long-term economic plan". Mr Cameron has always insisted that he works as hard as any of the previous residents of Number 10 and retains his zeal for social reform and the NHS, recently describing improving the health service as his "life's work". He has always defended the coalition too - paying tribute to Nick Clegg in his victory speech on the steps of Downing Street - even though he increasingly spoke of his frustration at not being able to govern as a true Conservative prime minister. All those who have wondered what he might have done had he been given a free hand, what sort of prime minister he might have been, will find out in the weeks and months ahead.